To become a Community of People who are seriously moved by the Spirit of Jesus to care for one another, personally and in community and share responsibility for bringing into being the Kingdom of God. 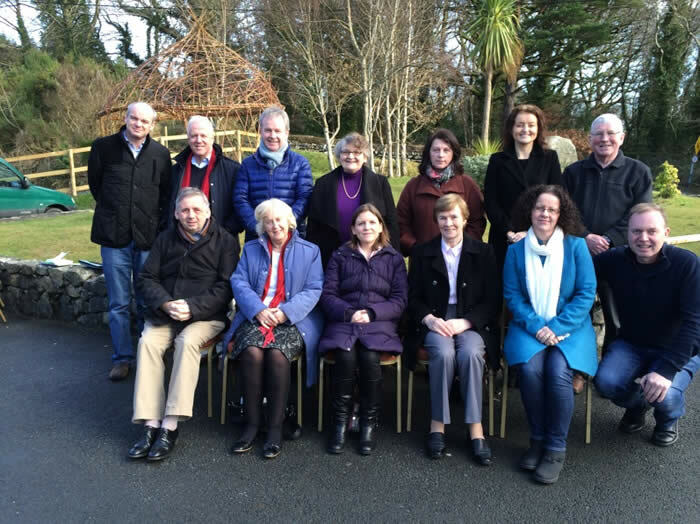 The Parish Pastoral Council (PPC) met for the first time in Glendalough on 24th Jan ’15 to consider and discern the path forward for the Parish and elect a Chair and Secretary. The meeting was facilitated by Donal Harrington. Election of Chair and Secretary and a roadmap for the newly elected PPC. In 2013, Pope Francis laid out his vision for outreach at every level of Church which is documented in the apostolic exhortation, Evangelii Gaudium (The Joy of the Gospel). The PPC organised Joy of the Gospel Book Clubs in the Spring and Summer of 2015 ‘How can we renew the parish to be an expression of the Joy of the Gospel? These book clubs were held in parishioner’s homes. A document summarising the discussions into themes. At the conclusion of the Synod of Bishops in 2014, Pope Francis decided to make public the Relatio Sinodi, the document which concluded the synod’s work. The aim of this was to describe the Vocation and Mission of the Family in the Church and Contemporary World. The document Relatio Sinodi was distributed by the Archbishop to all Parishes in Jan 2015. Each parish was asked for the document to be read and the accompanying questions answered. Feedback was to be ready for submission to the Irish Episcopal Conference before being forwarded to Rome in March 2015. The feedback formed part of the discussions at the Synod on the Family which took place later that year in Rome. A working group made up of members of the Mount Merrion and Kilmacud PPCs was established who met to discuss the document and questions posed. The aim was to produce a Relatio Sinodi Focus Group Discussion Guide which was a list of simplified questions that were posed to Parishioners at facilitated focus groups. The focus groups were held in March ’15. A summary document that was submitted to the Irish Episcopal Conference. A Family Fun Day was run in June 2015 and 2017. A day filled with games and fun for the family. ensure volunteers in the Parish were identified, recorded, Garda Vetted and trained. The program ran from the summer of 2015 through to the end of the PPC’s term and will continue to be run by the incumbent PPC. An annual Corpus Christi procession was run, inviting all Parishioners to partake. A survey of parishioners and local school parents was conducted to understand the preferences around the format, timing and involvement in a family mass. This resulted in moving the Family Mass to Saturday evening at 6pm, the establishment of a children’s choir and a reformatted liturgy. In Sept 2015, a meeting was held by Mount Merrion and Kilmacud parishes to discuss a response to the Refugee Crisis and consider the Popes request that each parish take two families. Local schools assisted with fundraising activities to help with various refugee projects. A Syrian family was housed in the Parish area. A house was found for them and the parishes funded the rental of the property. Parishioners were asked to sign up to regular funding to assist the family with the costs of living in Ireland until they found employment and were integrated into the Community. The PPC held a Volunteering Day to attract new volunteers to the ministries of the Church. Volunteer forms were completed on the day. A new website was launched. A webcam was installed to stream masses live to parishioners. It was noted that 18 weekday masses and 10 weekend masses took place in the three parishes. Other services such as confessions, baptisms, funerals, weddings etc. had to be considered. A Eucharistic Service is offered 1 day per week on a rotational basis between the parishes (Tue: Mt. Merrion; Wed: Clonskeagh; Thurs: Kilmacud). This provides lay people with the opportunity to lead. A template was provided in each Church sacristy for those conducting the service. People received relevant training. The PPC liaised with the three schools promoting three parish ministries: youth choir, altar serving and reading of the Word. 10 children signed up and attended training sessions. A Coordinator for altar servers was appointed who worked with the local parish primary schools to attract new altar servers. The PPC engaged with the local parish schools on several levels, e.g. preparation for the Sacraments of Communion and Confirmation. A special meeting was held in February 2017 to discuss the enhancement of spiritual growth of pupils and ways in which the parish could assist in progressing the links between the three primary schools and the parish. A meeting was held by the PPC in May 2017 with the Ministry Leaders of Kilmacud Parish to give each leader the chance to discuss with other leaders what their ministry is responsible for and also to raise with the PPC any issues that they may be aware of. Annual Easter and Christmas events are organised by the PPC. This includes but is not limited to Stations of the Cross, Easter Services, Christmas Carol Service, Christmas Family Mass, Nativity Play, etc.